These super cute little Kringles crocheted Christmas ornaments will make a great addition to your collection of Christmas decorations. In addition, Mrs. Kringle will make a lovely egg cozy for your Christmas breakfasts. Each of the two little characters should be about 8 inches tall – this is including the hat. If you prefer metric measurements, the finished Santas should be about 20 cm tall including the hat. 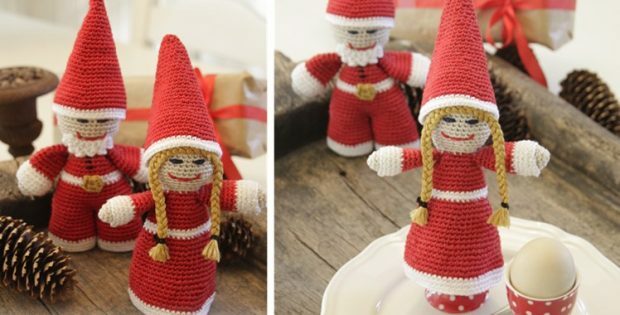 You can access the FREE pattern for these great crocheted Mr and Mrs Kringle Santas from Drops Design. To access the free crochet pattern for these lovely Santas to decorate your table, please click here: Meet The Kringles Pattern.